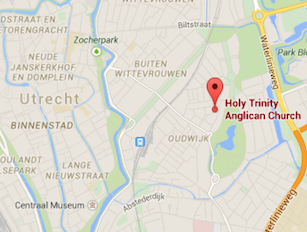 (b) Unofficial names: Holy Trinity Anglican Church Utrecht, Holy Trinity Utrecht Chaplaincy; All Saints Anglican Church Amersfoort, All Saints Amersfoort; Anglican Church Zwolle; Grace Church Groningen. Church in the Archdeaconry of North West Europe/Anglicaanse Kerk in Nederland (see www.anglican.nl). It is governed by the Ecclesiastical Law of the Church of England (see www.cofe.org) and the Constitution and Rules of the Diocese in Europe (see www.europe.anglican.org). 1 Chair, 1 Chaplain (Utrecht), 1 Chaplain (Amersfoort), 1 Associate Chaplain (Groningen), 2 churchwardens, 1 Secretary, 1 Treasurer, 4 Archdeaconry Representatives, and 10 further Councilors. Holy Trinity Chaplaincy is a welcoming community of Christians brought together by a shared love of Jesus with lively worship, Christian discipleship, friendly fellowship, and a desire to bring the love of God to others. The Chaplaincy may have paid staff and other workers, and also may compensate volunteer workers for their activities to the maximum allowable annual amount. Our objective is to worship God, to administer the Sacraments, and to proclaim the Gospel, the Good News, to the world both by word and by actions of loving kindness both as individuals within the church and in supporting charitable works as a church locally and around the world. Our ministry includes the development of disciples of Jesus Christ through teaching and prayer and the pastoral care of those in special need in our congregations. Our church websites (see 4 above) identify in greater detail the various activities that support our objectives.